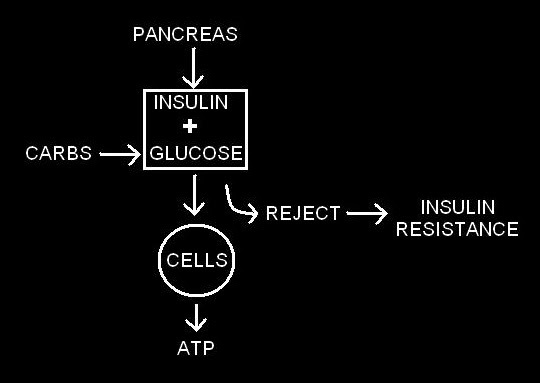 On the previous post we touched on Insulin Resistance (IR) a little bit. On a blog devoted to metabolic disorders, IR is too important a subject not to have its own independent post or page. IR is of critical importance as it is the primary cause of weight gain & Obesity and has strong associations with chronic diseases like Diabetes, Hypertension and Coronary Heart Disease (CHD) and many many more. But there is much more to IR that is important to us. IR as a subject is very vast to be covered fully under the scope of this post, but nevertheless let’s take a very brief look into some aspects. As the name suggests, IR basically means that the cells of the body become resistant to accepting the circulating hormone Insulin. That is a cause for concern, as Insulin’s primary role is to cart the glucose in the blood supply and deliver it to the cells for further metabolic processing and conversion to energy (ATP). So with IR the blood glucose starts to remain underutilized & gets elevated. This signals the pancreas to release more Insulin as it sees that glucose levels are still high. This only compounds the problem. IR also means that Insulin itself remains in circulation for extended periods, and causes its own harm. It is definitely a pro inflammatory hormone and causes the advent of chronic low level inflammation within the blood vessels. You can imagine the consequences of chronic inflammation within your vascular system. To understand IR better, let’s first look at the action of Insulin, or at least actions that have been studied and understood till now. Insulin primarily (1) delivers glucose to the muscle tissue to be converted to ATP and used as energy (2) encourages the conversion and storage of glucose into glycogen by the liver and discourages its release back into the blood as glucose. (3) pushes glucose into adipose (fat) cells to be stored as fat (that is how weight is gained) AND blocks its release and use as energy. 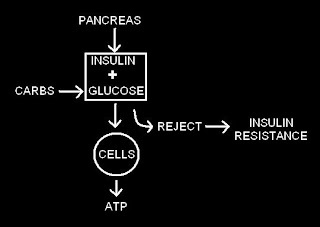 Now, with IR the above three roles of Insulin get blocked and the resulting consequences would be something like this. 1. If insulin resistance is strictly of the muscle tissues, insulin and sugar will both rise. Since the liver is still responding normally to insulin, glycogen stores will be filled from the ample glucose in the blood based on the "signal" of the also elevated insulin in the blood. When the muscles - which are starving not because the glucose isn't circulating right in front of them but because they cannot utilize it - signal that they are starving and need glucose, the liver (still responsive) can respond with additional glucose from its ample glycogen stores. This further elevates blood sugar, especially after long periods of fasting and at dawn. Exercise would play a critical role in controlling blood sugar & circulating insulin levels as it would strike at the core problem. 2. Hepatic (liver) IR will lead to the over production of glucose by the liver. Recent studies indicate that this seems to be the larger problem with Type 2 diabetics, as the pancreas is still able to generate some Insulin. Because of IR, the liver doesn't get the signal from the pancreas to stop glucose production. For the type 2 diabetics, the liver dumps far too much glucose into the blood stream than for a non-diabetic both in the post-meal and in the fasted state. And in either 1 or 2 if the fat tissue is still responding normally to insulin, weight gain which is very "stubborn" and difficult to reverse - is the obvious result. 3. Scenario 3 is true for mostly leaner people with metabolic disorders. In diabetics mostly Types 1 or LADA suffer from this kind of IR. These types of people would suffer from elevated glucose but not lose or gain weight easily. In either of scenarios 2 & 3 exercise will not help much unless the timing & type of exercise has been carefully thought out. It is highly unlikely that IR will strike in either of the scenarios in isolation. In all likelihood it manifests as a combination of two or all three of the above. Assessing what type/s of IR affects one, can only come about by a lot of self testing and observation, or possibly through carefully timed/devised serum insulin tests. Once the type and quantum/stage of IR is understood, devising a plan for resolving the metabolic challenge is possible. 3 studies on centenarians (100 year + old persons) could not find much in common amongst them. They have high cholesterol and low cholesterol, some exercise and some don't, some drink / smoke, some don't. But they all have low sugar, for their age. They all have low triglycerides for their age. And they all have relatively low insulin. Insulin is the common denominator in everything associated with poor health. High Insulin levels are found in people suffering from obesity, hypertension, diabetes, osteoporosis, cancer etc. The best way to treat virtually all the so-called chronic diseases of aging is to treat insulin itself. And is there any better and safer way to do it, than “Nutritional Ketosis”. I doubt it.